Some of the Enough is Enough team are in Barcelona at the moment to continue our work on a documentary about the situation in Catalonia. On December 17 we will travel to Lesvos (Greece) and later to Athens to produce on the ground reports about the situation of refugees in Greece. But we need your support to be able to do that. A few people of the Enough is Enough team are in Catalonia again to continue their work on a documentary about the current situation there. On December 17 we will travel to Lesvos (Greece) and in January we will travel from Lesvos to Athens to report on the ground. At the moment we are also pushing a crowdfunding campaign of the Cars of Hope collective on our blog. Cars of Hope will work with refugees on Lesvos and in Athens and we will document their mutual aid campaign in Greece. The money from the Cars of Hope crowdfunding campaign will be used for their work with refugees only. 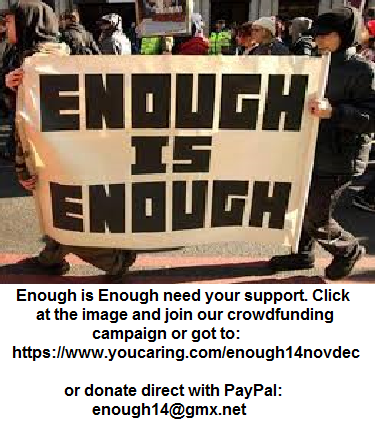 Thats why Enough is Enough need their own crowdfunding campaign (Apart from maintaining our site, buying new equipment and our work in Catalonia, Greece and many other countries).